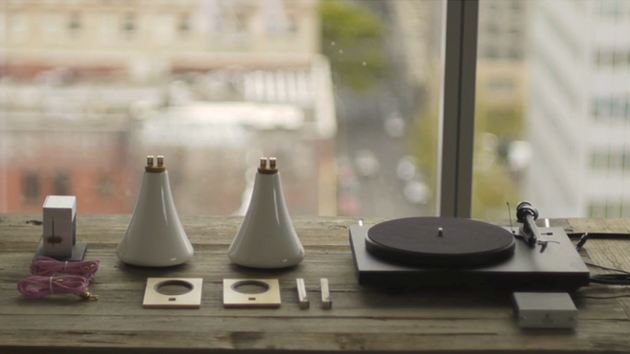 Joey Roth, a designer based out of Portland, created this stunning film to compliment one of his newest products, the “Ceramic Speakers”. We’ve seen a few items like this before, specifically “The Natural Speaker” by Studio Joon&Jung. This one’s very different though and shows us how to assemble the ceramic speakers and the connection between them and a turntable. I particularly like the simplicity of not only the speakers but also the connecting parts, it’s so easy to put together it’s pretty unreal. I also like the background and the way it’s laid out neatly and precise. For more work from Joey I would recommend checking out his portfolio site where you can also find the “Sorapot”, a unique and modern teapot, and you can purchase these Ceramic Speakers seen in the video below.